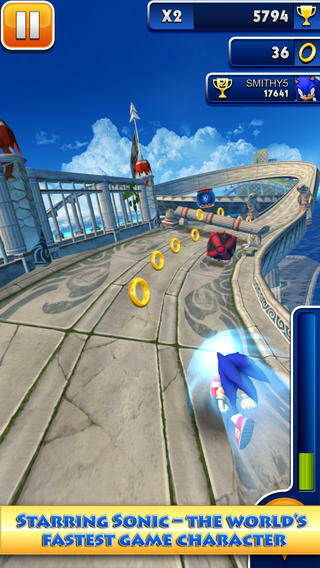 Sonic Dash: Eggman and Rouge in the new update! In a recent update, Sonic Dash not only got a new global challenge with soon-to-be playable Rouge the Bat , but also a new boss similair to Zazz, in the form of Sonic's Arch-Nemesis Dr. Eggman. There are also new achievements you can get by dashing with Silver the Hedgehog. - The Dr. Eggman fight is very similair to Zazz, but of course in a different image. Instead of flying on Zazz his flying.. ball? 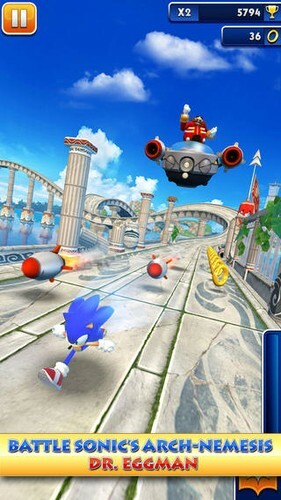 Eggman pilots his own vehicle, armed with rockets and bombs to slow you down. Feb. 13, 2014, 6:23 p.m.
Feb. 14, 2014, 8:12 a.m. I was going to update It but then the message “enter password to start update” popped up and I was like “kay” and preceded to type It In but then It told me I was wrong…next thing I know I'm on the ground face palming myself with my Ipad because I forgot the password…poop.